So I'm sure by now every one has heard of the innovative makeup & skincare company Glossier. 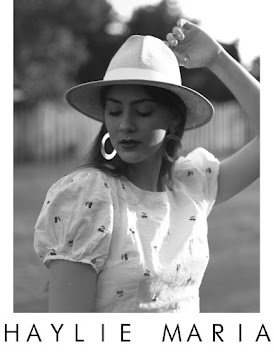 With their famous millennial pink branding and simplistic, minimal aesthetic, there was quite a pull towards this brand from bloggers and average internet explorers. After knowing about the brand for some time, I for some reason had the urge a couple weeks ago to take a plunge and buy a couple of their products to see how they compare in real life vs. the hype. 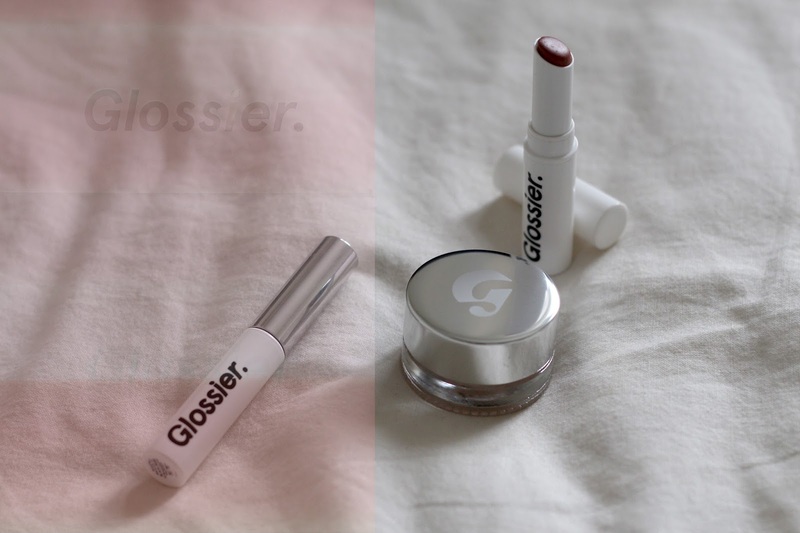 Although a makeup & skincare brand isn't about how responsive the website is or how great the shipping options are, Glossier excelled in pretty much every way in terms of the business side of things. The options of bundles on the website made being a first time shopper way easier than ever before because you can choose a set of three products depending on what you want to try. There is the skincare bundle, Phase 1, and the makeup bundle, Phase 2. For me, trying the Generation G lipstick was top priority. Boy Brow has been a cult classic since Glossier emerged on the beauty scene, so when I saw those two paired together with the Stretch Concealer, I was already to hit buy. With the Phase 2 set, you get face, eyebrows, and lips so that already equals the perfect combination. On days where I actually want to wear makeup, these products are the ones I will reach for because they are the bare necessities. I have texturized and acne prone combination skin, and really am still trying to define it further. In these photos this is my natural skin, no airbrush at all but just some Stretch Concealer and a quick transparent E.L.F powder. Sure the texture is still there when normally I would edit it out, but in general I truly think that this concealer adds so much life to my skin even with out foundation. Being minimal with my makeup application is something that ails me every single day I try to wear makeup. Drug store concealers just don't do my skin justice and I actually think they sometimes enhance my blemishes if I'm not careful. The Stretch Concealer can be built up in areas you need the extra coverage while just evening the tone of the rest of your face. Personally the best way to apply was with my fingers and it gives me a lot more control too. Generation G was the first product I tried out of my little haul, and I instantly fell in love. The colour I chose was "Leo" and is described on the website as "a warm cocoa brown". I think the idea behind this lipstick range is that the sheer pigment blends with your natural lip shade and creates something of a personal colour. For me the brown shines through less then the warm orange tones in this and really creates a terracotta colour on me. To be honest, I was instantly surprised that Glossier hadn't thought about the scent of this lipstick because when I first applied it, I could smell the generic "unscented" lipstick smell and it didn't appeal to me. The lipstick formula is buttery and smooth so when that scent hit me I was definitely unsure of what they were trying to do here but I think the brand itself really tries to be generally unscented/gentle smelling. Overall, I'm still obsessed and I love, love, love the build-able aspect of this lipstick and I think it's something that has never been extremely appealing in the makeup world but Glossier did it and did it well. Boy Brow has the least wow-factor for all the products I've tried so far, including the samples of primer and their new fragrance "You" I was sent. Boy Brow has always been raved about endlessly it seems and quite frankly I normally use a dried up mascara which has the same effect. BUT I will say, Boy Brow's application is the easiest brow enhancement product I have ever used. With the small spoolie applicator and handle, Boy Brow gives you an incredibly precise and simple experience all with the outcome of natural looking caterpillars. For me having dark eyebrows has always been difficult, (I know, first world problems) I never knew how to shape them in feminine ways or fill them in without them becoming black bricks on my forehead. So when I rediscovered my mom's old transparent brow gel I realized for my brows it's less about colouring them in and plucking but more about taming them and them staying put together through out the day. After clear gel, I wanted more volume, so I started using my mascaras and now I think I've finally found an upgrade to that... freakin' Boy Brow, people. Quite frankly I haven't tested how many wears I've gotten in terms of wear to price ratio but it's something I will reflect on in the future here I'm sure because right now I'm definitely in the Honeymoon stage of this romance. 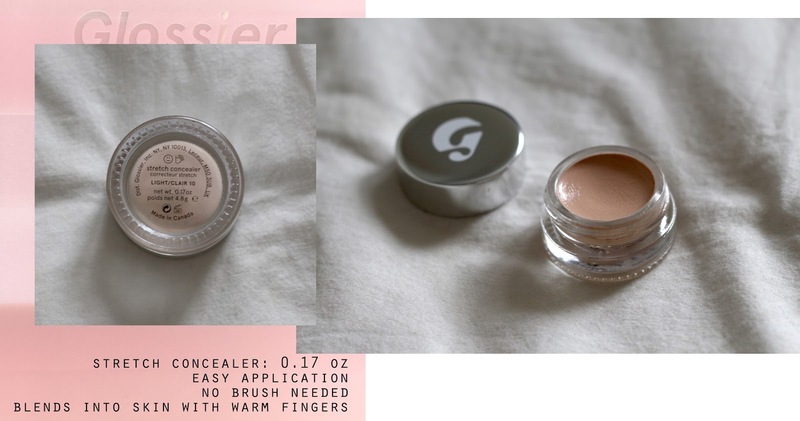 I want to say thank you Glossier for living up to the blogger/YouTuber hype, and I encourage everyone to try at least one of their products. I am not even a makeup guru or collector and I found that this line gives me what I need as a Makeup Minimalist (what I like to call myself).